NOTE: This post, composed nearly 21 hours ago, is just now making it onto the blog due to poor wifi access, little time, and a need for sleep. I write now from Point State Park, at the convergence of three rivers, industrial commerce, bustling traffic, and the spray of a magnificent fountain. Across the Alleghany, Heinz Field glistens with its ketchup-colored logo and mustard-looking seats. 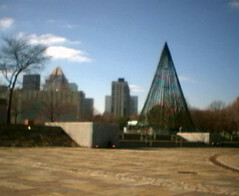 The Carnegie Science Museum, irregular in shape and sparkling in the light sits on another point near Heinz, a cone-shaped antenna (is it real?) pointed to the sky. 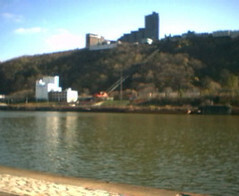 Across the Monongahela, a trolley carries it passengers up and down a steep incline, carved over the centuries by these three rivers. I come to find out that this is the The Duquesne Incline. The Ohio looks out to the west, snaking under a bridge and out of my horizon. Behind me, the downtown of Pittsburgh, a place where I have barely just begun to explore, but will on my walk back to the convention center. Why am I here now? I had the opportunity to meet with Kyoko Sato, NCTE President, and talk with her during a taxi ride from the Omni (NWP Headquarters) to the Hilton (NCTE Headquarters). These are the types of meetings and conversations that conventions allow—these captured spaces, these few moments between sessions. This is time to really talk to others, to share one’s work, to become involved on a larger level. And, now that I have had a moment to talk, I now have a moment to reflect before heading east on a five block walk to the convention center. So, I walked out to Point State Park, moving slowly amongst all the bustle and rush about me. This is, oddly enough, a peaceful place in the middle of an urban, industrial city. Steel, in the form of bridges and buildings surrounds us. For a moment, I needed to stop, stop to see Pittsburgh for it’s natural beauty and man-made beauty, too. I got to walk in the remnants of the first fort on the point. History surrounds me, too. There is more, but no more time for now. 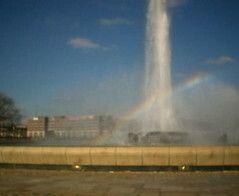 The pictures, taken with my iSight video camera, are grainy and do not do the area justice. 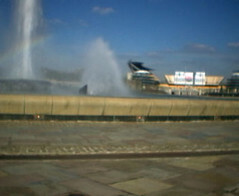 But, it was all I had to capture an image, and I wanted show something of my own trip within a trip, here in Pittsburgh.